ConservationFIT is partnering with organisations that host ‘ambassador’ animals whose footprints can help us protect their free-ranging cousins. Oregon’s Wildlife Safari is helping us by collecting prints from their cheetahs. Maddy Tweedt, a carnivore keeper there, recounts her team’s trials and tribulations in finding the ‘right kind of sand’ to collect footprints in Oregon. Thanks to the dedication and determination of folks like Maddy, ConservationFIT will be able to build really robust reference algorithms for species like cheetah. By Maddy Tweedt, Carnivore Keeper, Wildlife Safari, Oregon. The carnivore department at Wildlife Safari in Winston, OR was recently approached by Dr. Karin Schwartz with a unique opportunity to participate in a project to help identify cheetah prints in the wild, by comparing them to prints collected in sand from cheetahs in captivity. We started this, uh, process with Sage, a mother-raised breeding cheetah. Initially, we used a strip of sand about 11 feet long and two feet wide along a fence line. One keeper stood outside the gate and offered chunks of meat on a chopstick as an incentive for the cat to walk the sand track, while the other marked which paw prints were the left rear, and created the setup for taking photos. From the beginning, challenges arose! Hmm – this sand doesn’t look exciting – dark and soggy…. There are essentially three categories of cheetahs at Wildlife Safari: breeding cats, exhibit cats, and ambassadors, which are hand-raised. The setup was an odd one for Sage at first, having one keeper in front of her with food, and one behind her, and fairly close, to try and capture appropriate paw prints. It took us three days to collect 20 acceptable prints from Sage, and we wondered what we’d gotten ourselves into. Waning food motivation eventually led to lack of interest and wandering along the fence line. One day, she simply shifted herself back into her enclosure and was “done.” We worked out some bugs that day, realizing that longer strips of sand would result in fewer passes, thus creating less stress on keepers and cats alike. We also had to take into account the fact that our cheetahs are spread across a fairly vast expanse of land in a variety of enclosures, essentially meaning a trip to each pen, dragging plastic totes full of sand; some used…which means mixed with giraffe urine. It was the demeanor of the individual cheetahs that determined our eventual rate of success. The ambassadors were much more comfortable with our presence, and we felt like rock stars after completing two successful sets of 20 prints in one day. A combination of long stretches of sand (up to about 30 foot tracks), and not feeding the animals before we did the study (imagine, hungrier animals were more apt to cooperate! ), and improved technique overall in the speed with which we took photos and marked prints, was allowing us to fly through the 400 prints were hoping to gather. We had almost hit the halfway mark, with eight out of twenty cheetahs completed, when a website glitch led us to our biggest hurdle of the project so far: sand. 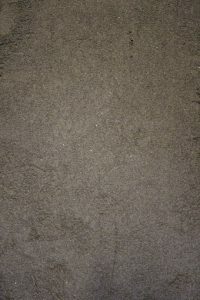 The sand we were using from our ungulate department, both used and fresh, was too dark and coarse for the photos. Even supposed “play sand” purchased from a local home improvement store proved too wet and dark. Let’s try laying it down on plastic…. pany that assured us they had the right product for our needs. 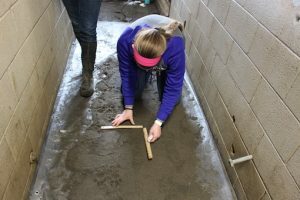 When we arrived (very hopeful to be able to continue our project) we were informed that the sand was in fact light brown masonry sand, however because we are in Oregon and the sand was from a pile outside, it was going to be dark and wet. We were still hopeful, and left the lot with roughly 100 lbs. of sand. We tried various methods before coming to our fourth (but not final) method of capturing the paw prints from our cheetahs. One of our cheetah enclosures shares a building with our two Sumatran tigers, and we had worked a plan to use the hallway between the two enclosures. idea of patting the whole track completely, we decided to go half and half; half the sand would be compacted and the other half would be loosely flattened. Sanurra, our resident 12-year-old hand raised cheetah, was significantly lighter than we were, leaving us slightly skeptical as to how her footprints would appear. We slowly walked Sanurra across the sand, encouraging her with small chunks of meat. 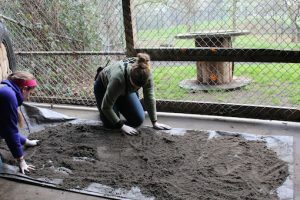 After one pass through the track we decided that we did not obtain enough footprints to determine if this new sand was going to work, so we encouraged her through the sand one more time and then put her back into her yard while we inspected the prints. As we searched the track, we found several left hind prints, however the prints themselves were very hard to see, some were missing toes and others were slight, swiveled prints where Sanurra decided she wanted to turn around. After we realized we did not get any viable prints with the fourth type of sand using our third method, we became very frustrated. Realizing that research does not always yield perfection, we still felt that the results of our ninth attempt were matching the ones from our first attempt. We decided to call in the experts and contacted Zoe Jewell (co-founder of WildTrack) to see if she might have any other tips or tricks that we could use. 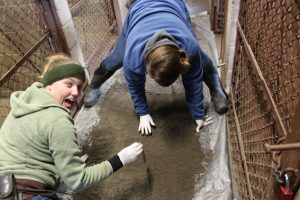 After a great conversation and laying out the problems we were facing, we decided we would try to dry the sand in the tiger building and cross our fingers for a warm (or as warm as it can be in Oregon in the middle of January) day to try to move the tarps out to a cheetah yard to collect our footprints. Hmmm… still a bit soggy…will it ever stop raining outside? Now here we are, with what will be our fourth method and fourth type of sand, ready to create some cheetah footprints. Stay tuned as we continue to chronicle our trials and tribulations as we partner with our captive cheetahs to help save the lives of wild ones.